This is a lovely spicy variation on your classic roast vegetables, using a small amount of oil and lots of tantalising tastes. Goes beautifully with masala-marinated chicken, or with plain grilled meat. Fry the onion in the spices for 1-2 minutes, stirring frequently. Drain the potatoes in a large colander and toss several times to roughen up the surface of each potato. Tip the potatoes into the pan with the onion and spices, season with a few twists of ground black pepper and toss together until the potatoes are lightly coated. Tip everything onto a large baking tray and roast for 30 minutes. 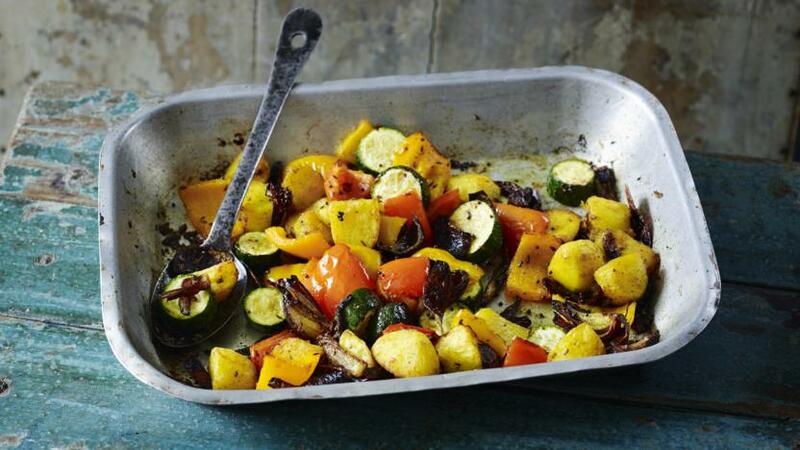 Take the tray out of the oven and add the peppers and courgettes.